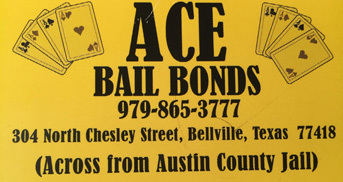 Ace Bail Bonds is located across the street from the Austin County jail in Bellville, Texas. If you have a friend or loved one in the Austin County jail, just give us a call and we will get them out right away! We specialize in both large and small bonds. We make the process simple and easy, and we take cash or credit cards. If you have questions about the bail bonds process; give one of our bondsman a call and we’ll be happy to explain how it works. We are open 24 hours a day, 7 days a week so call us now! 979-865-3777.